Info "The word is that if you mimic the rhythm of Señor Poncho, people will throw themselves at your feet in slavish devotion, and a warm breeze will blow." Chunky Salsa is one of Orbulon's Microgames in WarioWare: Smooth Moves. Its name is a play on "salsa", which can be either a type of food or a type of dance. 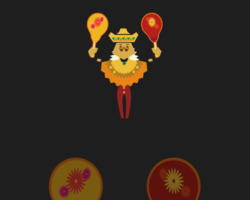 The player must shake the maracas to the order of the instructor. 1st level difficulty: Three shakes. 2nd level difficulty: Four shakes. 3rd level difficulty: Five shakes. Like Saving Face and Stir Crazy, for unknown reasons, this microgame's music is absent in the Sound Studio. This page was last edited on October 11, 2018, at 23:00.